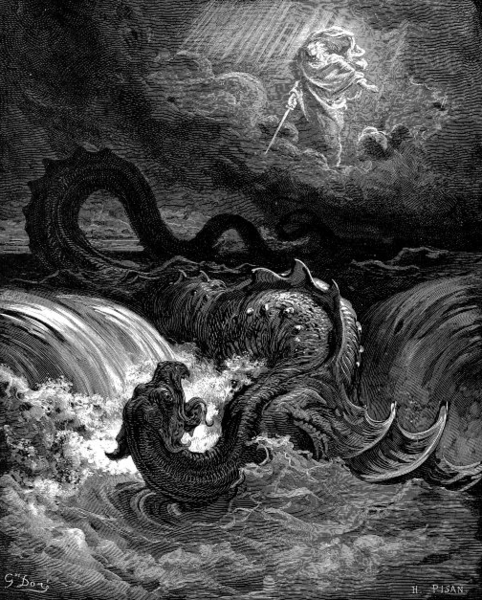 According to Hebrew mythology, Leviathan is a sea monster, believed to have been created on the fifth day of Creation, and often depicted as a sea dragon of huge proportions. Several interpretations of its possibly mundane origin identify Leviathan with such varied creatures as the whale, the Nile crocodile, and even exotic species of dinosaurs such as parasaurolophus and kronosaurus. Metaphorically, the monster is thought of representing an image of Satan, a demonic enemy of God’s order. In 1949 the German author Arno Schmidt (1914 – 1979) published his first literary work, a small book bearing the title “Leviathan”, a dark, pessimistic triptych, putting forward a stunning metaphor for the monster: according to Arno Schmidt’s philosophy, heavily influenced by the reverberations of the war, Leviathan is the creator himself (or itself), whose predatory, blood-thirsty nature was passed on to humans and to the natural world as well. “Had the gods granted me three wishes” is written in the third story, “the one would be to immediately rid the earth from humanity. And from the animals too”. All three short stories in “Leviathan”, laid out in first person in a diary like manner, end with the abrupt interruption of narration and the death of the main character under cul–de–sac circumstances. Throughout the book, contempt is repeatedly expressed for the great rulers and conquerors, for politics, for the state itself and for the petty world of commerce and profit. All these, according to Schmidt’s characters, are only manifestations of the evil nature of Leviathan, reflected upon the world. “Worshipping Alexander can be forgiven only to twenty-year olds” writes Pytheas of Massalia in “Gadir”, the first story. Remarkably, the characters bother themselves with Science and Mathematics amidst the most unfavorable conditions. And Schmidt makes sure that “Leviathan” cannot be properly comprehended without some reasonable knowledge of Mathematics: From the very first few pages the reader is faced with mathematical riddles and calculations. “Gadir or Know Thyself”, the first story of the book, is the supposed diary of Pytheas of Massalia (4th century B.C. ), the ingenious ancient Greek explorer and scientist, presented as an almost hundred years old man kept for 52 years in a Carthaginian prison in Gadir (today Cadiz) for having illegally boarded and travelled on a Carthaginian ship to the lands of extreme north. Pytheas’s narration, apparently covering a time span of about a week, is a medley of his memories, thoughts, dreams and paranoid plans of escape from his Carthaginian prison in Gadir fortress, ending in delirium and his death. The actual Pytheas of Massalia, a historic figure, made a journey of exploration to the extreme north, probably as far as the arctic circle, bringing back to Greece the notion of a distant land called Thule, a term that still to this day inhabits the edge between geography and legend. He probably circumnavigated Britain, encountered pancake ice floating on the “Cronian Sea” and reached Mentonomon, possibly some shore of the Baltic sea. His own account of his travels is lost: only some excerpts survive in works of other authors, mainly Strabo, Pliny and Diodorus, often apparently paraphrased and accompanied by bitter disbelief. Pytheas made interesting contributions in latitude measuring and was the first to associate the tides to the phases of the moon. Very little is known about Pytheas’ life and death, the circumstances or even the year of his travel. In Schmidt’s ingenious story, a gloomy version about Pytheas’ closing days is offered, depicting him imprisoned for more than half a century. Pytheas is allowed to keep notebooks: “from time to time, they take from me my mathematical and geometric manuscripts and send them to Carthage, to find out whether there is something noteworthy in them”. The spherical shape of the earth, “taught and proved centuries ago by Pythagoras, Thales and Anaximander” holds a central position in his thoughts and he repeatedly expresses contempt for those who fail to understand it, like the historian Herodotus, or those who consider it unimportant. “You see” he notes, ”for these disgusting merchants it is indifferent that the shape of the earth is spherical, because this has no effect on the selling of their merchandise – the pigs, I just might once hint about some new worlds across the seas of the south; or that sailing westwards you could reach the eastern edge of our own: Indies! And who would not think then of spices, gold, dough?” And “Herodotus is the best example of how even great, deep educated, rich minds can make ridiculous mistakes when they miss scientific and above all mathematical knowledge. He had heard something about the roundness of the earth […] and he claimed it meant that the round disk floats on the Oceanus. […] He had understood nothing of all this; a sad sight all this, there is no end. Pity.” At some point in “Gadir”, Pytheas argues about the possibility of “extracting the solar system’s proportions from the duration of lunar eclipses” and actually provides solid and clear arguments on how this could be done. A lunar eclipse results when the earth happens to pass between the moon and the sun, casting its shadow on the moon. According to Pytheas, “because of the disproportionally greater distance of the sun, we may accept the earth’s shadow as approximately equal (a little smaller in reality!) to the earth’s diameter”. Therefore, during a lunar eclipse, the moon moves across a distance fairly equal to the earth’s diameter: to measure the moon’s diameter, we only need to compare the lunar disk to the earth’s shadow. Pytheas observes that “each day, the moon lags 12 degrees behind”, 0,5 degrees each hour, an arc equal to the apparent diameter of the lunar disk on the sky. The longest lunar eclipses “last approximately 3,5 hours”, during which the moon proceeds by 3,5X0,5=1,75 degrees across the earth’s shadow. This means that the earth’s shadow, and therefore the earth’s diameter, is estimated to be 1,75/0,5=3,5 times the moon’s diameter. Finally, as the moon’s apparent size is 0,5 degrees, or 1/720 of the full turn, elementary trigonometry indicates that the distance between the earth and moon is almost 40 times the earth’s diameter, a fairly accurate result. Pytheas estimates this distance to be approximately 250 myriad stades (475000km, as a stade is equivalent to about 190m) and notes that “all these permit several paradox conclusions about our spatial conditions; the sun is at least 100 times further, some planets even further; the fixed stars’ distance is beyond any conjecture”. “Leviathan or The Best of all Universes”, the second story of Schmidt’s book, is the diary of a German army sergeant during the last weeks before Berlin’s surrender to the allies. It begins with a letter mailed from Berlin on May 20th, 1945. Exchanged for some cigarettes, the diary of a dead German army sergeant passes from the hands of a Russian Lance Corporal to an American soldier, a few days after Berlin’s surrender. This American “Jonny” mails the manuscripts, together with other belongings of dead Germans, as souvenirs, to his wife Betty. The manuscripts are a chronicle of the last few days of the German officer’s life and his futile effort to flee the town of Lauban, together with several other military and citizens, on a train linked to a wolf track, destroying the track behind. The story ends with the suicide of the unnamed narrator over the destroyed bridge on the river Neisse. Astonishingly, under such circumstances and even while being bombed, the German sergeant discusses his philosophy about the evil creator Leviathan of whom “we ourselves are part”, evoking elements of cosmology and non-Euclidean geometry. At some point, he refers to “thinking triangles”, a concept bringing to mind Edwin Abbott Abbott’s “Flatland – A Romance in Many Dimensions” (1884). Schmidt’s triangles proceed in examining the “parallel postulate” of Euclidean Geometry and discover that other geometries may be possible. According to the parallel postulate, at most one line can be drawn through any point not on a given line parallel to the given line in a plane. However, “some wise triangle examined a convex, two dimensional surface and found that here straight lines (i.e. the lines of minimum distance) would become great circles, that there would no longer be parallel lines and that the sum of the angles of any triangle would be greater than 180 degrees. Another found that using the same principles on a pseudosphere, there would be infinite parallel lines (perceived on Beltrami’s limit circle) and that the sum of angles would be less than 180 degrees”. He maintains that the universe is finite yet unlimited and explains our perception of it as an illusion, created by our brain. “[…] the velocities of celestial formations increase with distance, approaching the speed of light limit. […] Think of a sphere […] placed on a tangent plane and the approximately uniformly moving bright points on that spherical surface being projected on that plane, then you would have something similar. […] Our brain simplistically (yet sufficiently from a biological point of view!) develops a three dimensional, Euclidean, indefinitely infinite space, a small piece of the tangent surface; this in fact is convex and enclosed in a four dimensional one […] Limitless yet not infinite”. Thus Schmidt’s sergeant discusses two of the possibilities about the global geometry of the universe. First, a constant positive curvature universe, which can be thought of as a hypersphere, on which no parallel can be drawn through any point not on a given line. And second, a constant negative curvature universe, modeled by Eugenio Beltrami’s (1835 – 1900) pseudosphere or tractricoid, a negative curvature surface with infinite extent and finite volume, sharing with the sphere the same area and volume formulae. On the pseudosphere infinite parallels can be drawn through any point not on a given line. “Enthymesis or H. I. H. Y.” (where the enigmatic acronym may stand for “How I Hate You”), the third story in “Leviathan”, is the diary of Philostratus, a supposed student of Eratosthenes (ca. 276 – 195 B.C. ), obsessed with the flatness of the earth, while on a surveying expedition across the Saharan desert. It starts in medias res, at the end of the third day of the expedition, after almost 120 kilometers of walking. Distances are measured simply by counting steps: “I have to invent a new counting device” notes Philostratus, the leader of the expedition. ”Deinocrates takes every morning his rosary and plays with the beads in his fingers. Aemilianus makes every day 2500 dots on his wax plaque (one for each tenth double step). I, until now, was moving my system of cogwheels with my thumb”. Philostratus strongly opposes his teacher’s Eratosthenes teachings about the roundness of the earth, considering it to be a disk instead. “Once I said to Eratosthenes: The characteristic of the spirit is that it longs for infinity; only the disk is more infinite than the sphere, therefore the earth must be a disk. […] But I said nothing about the most important thing: where to escape to if the earth is a sphere?” Philostratus also argues about the physical impossibility of the spherical shape, considering it as “a most rare limit case of countless ellipsoids by revolution, too rare to really exist”. And when faced with the challenge of presenting any practical implication of such theories, almost playfully he points out that mountains are measured to be less high on a curved earth, since the observer stands higher than the root of the mountain. The most enigmatic paragraph of the book appears on the eighth day entry of Philostratus’ diary, where he jokingly appears to be posing a puzzle: “Caressing the ten digit; I love it like solitude; and why? Pah! Listen (listen you who wish, ok? ): infinite numbers begin with a 6, with 62457 only few, with 6245763016 none that you the mob know; and then more and more emerge from endless number depths, come you! And that’s why hand up to the Alpha Lyrae – ho ho, who’s going to guess?” It is remarkable that Schmidt has committed here an obvious anachronism, expressing numbers using the modern positional numeral system with ten digits, including zero, instead of the ionic numeral system used by the learned ancient Greeks of the Hellenistic period, which involved 27 different symbols and operated on an additive principle. Apart from this, Philostratus appears to be mistaken in believing that the numbers beginning with 62457 are fewer than the numbers beginning with a 6 while in fact there is a one to one correspondence between these two sets of numbers. While “Leviathan” is obviously about Schmidt’s “evil creator” pessimist philosophy, it is also a work interestingly permeated by the question of the shape and the size of the world or the cosmos, from a mathematical point of view. Schmidt himself had displayed keen amateur interest in mathematics: on his bookshelves, among literature, poetry and travel books, there were several editions about astronomy and mathematics, including works of Gauss and Leibniz and also, curiously enough, tables of logarithms and trigonometric numbers. It is known that for some time, besides his work at a textile factory, Schmidt occupied himself with the calculation of logarithms. 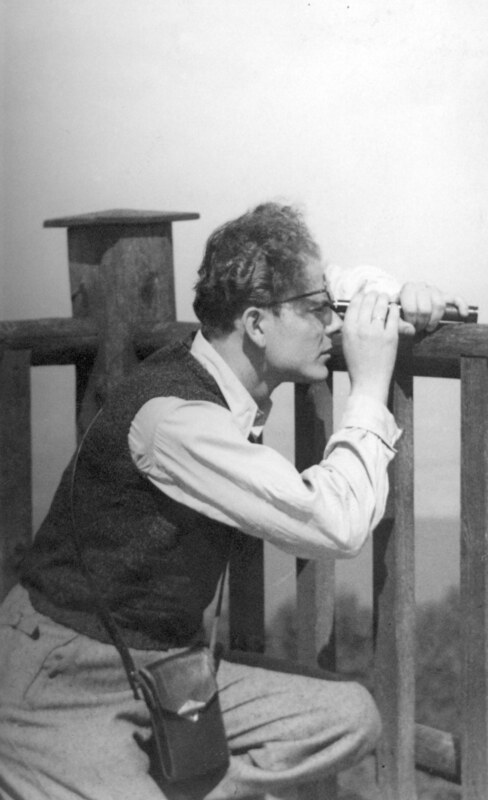 After the war he claimed that he voluntarily canceled his studies of mathematics and astronomy at the university of Wroclaw during the Nazi regime, when his sister married a Jewish businessman, though this assertion has not been traced and confirmed. In his very first book Schmidt made meticulous efforts to clarify his high esteem of scientific and mathematical knowledge: in “Leviathan” it is presented as being against the monster creator’s intention for the world and as the measure of true greatness. “Who can only be great?” notes Philostratus in “Enthymesis”. “Artists and Scientists! Nobody else! And amongst them, the humblest is a thousand times greater than the great Xerxes”.